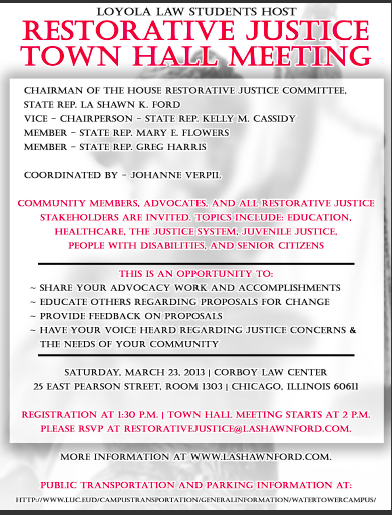 Sat, March 23: First Meeting of NEW House Restorative Justice Committee! √ CHECK. WE DID THIS! Come to the Town Hall Restorative Justice meeting and tell legislators why you support transformative justice. 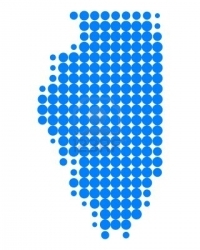 The Restorative Justice Committee is the first of its kind for the Illinois General Assembly and we hope that you will attend the very first event, the Town Hall Restorative Justice meeting. As many of you know, restorative justice requires us to advocate for a system that considers helping victims and communities become whole again while holding offenders accountable in the wake of their crime, but also working to ensure that ex-offenders or returning citizens, both juveniles and adults, are successfully rehabilitated to live in our neighborhoods. For far too long our justice system has focused on punishment with little thought given to what happens to our families and communities when we fail to examine how actions are criminalize, whether sentences are being administered fairly, and what methods we have in place to ensure that rehabilitated returning citizens can move on with their lives once they have served their sentences.